When we hear of disasters happening especially natural disasters, it is easy for us to think of the end of time. Only today, I saw a news on a flood disaster somewhere in eastern Japan. I watched the video on CNN’s site and the whole scene struck me, so much so that I began to wonder if such happens in our country (God forbid! ), what will happen… what will be our reaction – not just as individuals, but as a people? What will be the response of our government? It is quite scary but the truth is with we are at risk here too. Those who stay on the Island end of Lagos (better still, on the coastal areas in Nigeria/Africa/World) should have a better idea of what I am talking about. How much land has been lost to the sea – Bar beach in Lagos which has become a shadow of itself and probably does not exist again, quickly comes to mind. 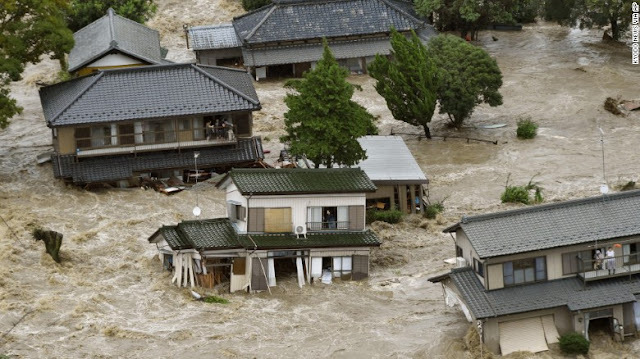 I heard only 1 person so far died in the Japan flood incident with 22 or so injured. Only God knows how many would have died if we were the ones struck with similar disaster (like I said before; God forbid). This makes me wonder if the National Emergence Management Authority (NEMA) of Nigeria is up to the task of really managing emergencies, or is just another source of employment and income for people or …? We all know how poor their rescue effort has been in the past, when we have had our own share of floods in some part of our country and other forms of disasters. We experience our own share of flooding as a result of heavy down pour and we know how bad the experience could be. I will not forget how I nearly missed an exam back then in school because of flood in my school area... I would have entered the flood facing my route but I changed my mind when I noticed the flood's current not just caring debris but moving two cars that packed on the road. I had to respect myself and give my life a future...lol (it wasn't funny o). One of these days, I may blog about climate change and global warming because of their connection with nearly all, it not all forms of natural disasters. May God continue to keep disasters away from us. Those fine houses are owned by those who don't care a dime. They are only interested in themselves...ofcourse, they have other properties in and out the country, so if one on the Island is affected, they don't care. As much as those of us on the mainland think we are safe, I fear, because of the worsening effects of climate change all around the world. Its just like we are sitting on a time-bomb especially coastal cities (eg. the whole of Lagos, not just the Island) when it comes to this flood issue. I have a younger brother studying at Japan. Immediately pictures of the flood hit the TV, i gave him a call to know how he was doing. He went on to explain to me how advanced the country is and how this type of situation is handled by an extremely organised and responsive emergency management. It explains the low number of casualties for a flood of that scale. I hope NEMA becomes advance too. Thank God you brother is safe. I hope NEMA becomes more sophisticated and very responsive soonest. I can't imagine these things in Naija. We don't know how lucky we are. Even the one that happens, we can hardly deal with it!!! We are lucky o, but we can't keep relying on luck all the time. We should adopt being proactive. Our government really need to up their game... We the citizens need to be sensitized on emergency response and disaster prevention. I am fine o...Don't know about party rice this weekend, I am still hopeful. May we never experience such disaster in Nigeria. It is frightening to watch on tv. I pray for the affected lives. May God help us all. May God help us all, I must chorus with you. Amen to your prayer. I don't know what else to say. Mami... How are you naa? It also got me thinking dear. May God continue to protect his children.. I still love my country.. If only we knew how blessed we are in nigeria. His first day in school. A lot of times (like every time), we take this blessing for granted and live anyhow. God will keep protecting us. Nigeria has a long way to go. Quite a pity. We really need to start our journey on that long way...the sooner the better. May God keep protecting us.